Home › News › Linking Belltown to Seattle’s New Waterfront – Thank You! 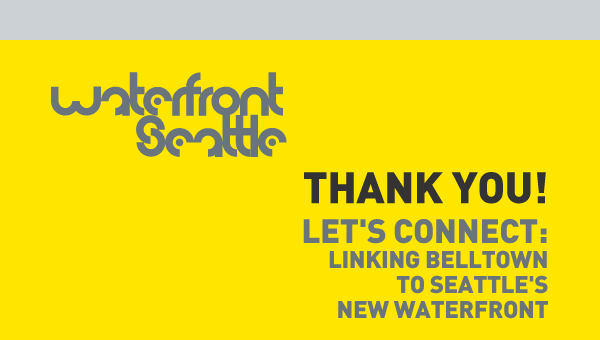 Thank you to everyone who attended the Let’s Connect: Linking Belltown to Seattle’s New Waterfront event on October 17. Your ideas, questions and enthusiasm for the future of Belltown will continue to shape the design going forward.We also wanted to send out a big thank you to the Belltown Community Council, Belltown Business Association and Downtown Seattle Association for their help in making the event a success. For those that could not attend or who want more information, check out our website or view the Belltown presentation here. Let us know what you think!